Finding information on a prospective day care can be time consuming and exhausting for first time parents. Not only are there numerous factors to consider, but many providers are difficult to contact, aren’t upfront about fees and tours can be tough to schedule with more than one adult attending. 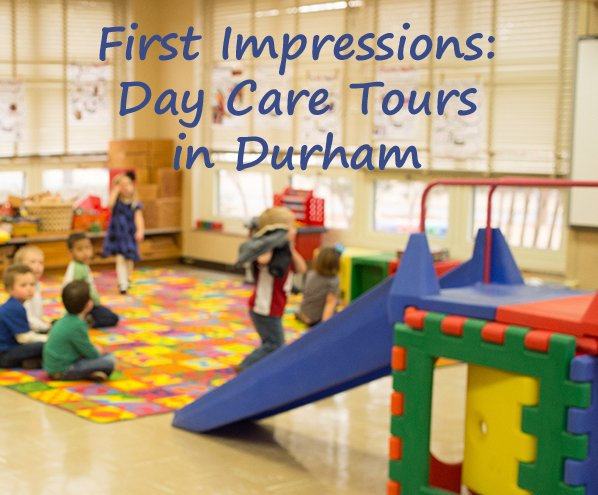 Starting next Tuesday, I’ll be posting a weekly series called First Impressions: Day Cares in Durham. In this series, I’ll be sharing my experiences touring day cares throughout the Durham region. These posts will include any information you can’t already find yourself online – fees, registration fees, opening hours, food menus, staff members and my take on the overall feel of the environment. I’ll be looking for your input too – If you would like to request a post about a day care or even if you have information about a day care that you can share with other readers, I’d like to hear from you. As always, feel free to leave me a comment or send me an email at themotherhoodscene@gmail.com. All tips, links and reviews are appreciated! Would love to hear/read feedback on soufriere kids development bilingual centre.. They have a location on Taunton and Harwood and a new location in the Menkes Somerset neighbourhood (Williamson and Gillett). Hi Arlene, I wanted to follow up and let you know that I still have your suggestion on my list of centres to see. I’ve tried calling and emailing this location a few times to get a tour and haven’t had any luck getting through. Hopefully that changes soon, I’m going to keep trying! If u can’t get through skd, then any montessoris in ajax (milestone, blaisdale, or brackendale) would be great! Or.. Smart start along Taunton? Loving ur reviews/walk throughs so far! Finding a centre for your child is one of the hardest things you will have to do. I’m looking around right now at the different centres in Whitby and find it overwhelming!! Out of all the centres you wrote about which one stood out the most to you or which one would you recommand? Each one seems to have positives about it. You’re right in noticing that each of the centres I cover in my blog have positives. I’m there for only a short time during each tour that I focus on reporting on what makes each centre special. I’ve avoided listing aspects that I’ve found negative as some of the things I don’t like are not always a negative for someone else! For example, I like daycares with lots of green space but this isn’t important for every mom. That said, there are centres that I gravitate towards more than others. I’d love to hear more about your search and in particular, what you’ve liked (or not liked) about the places you’ve seen. Feel free to email me at themotherhoodscene@gmail.com and I’d be happy to share my experiences with you. Thank you for taking the time to respond!